Sixty-nine stages will be included in the game when it releases on XBLA this fall — it was implied that more could be on the way via DLC at some point post-launch — but not all of them will be accessible to players who habitually find themselves back spawning at checkpoints. The game scores players based on how many times they die on a particular stage, how quickly they reach the end of it and how many collectibles they nab along the way. Anyone who desires to unlock all of the game’s levels will need to nail some seriously high scores, and if a PR rep who had already invested significant time into the game was struggling, what chance did a newcomer have on the cave level? It was that line of thinking that shamelessly led me to playing on an easier stage. Spidy has a deliberately weighted feel to him, so don’t expect to effortlessly glide through the air and suddenly change direction as you would in a Mario game. The alien feels heavier, akin to Deadlight or LittleBigPlanet‘s characters. That meant a healthy dose of trial and error, even on the easier stage. It felt easy enough in the beginning, actually, but it wasn’t long before things ramped up. It’s easy to not pick up on enemies firing projectile spines at you when straining to perfectly follow a line of collectibles curving through the air as Spidy makes his descent after bouncing off of a springy mushroom. Remember, though, that checkpoints allow players to get right back into the, quite literally, swing of things. Dying, of which I did a fair amount, never felt frustrating or cheap in this early level, though it’s certainly possible that it will in later stages. Spidy’s weighted feel takes a bit of getting used to, but the aforementioned swinging mechanic can be picked up on in a snap, and it’s instantly gratifying when that happens. Firing off strands of webbing one after another into the trees above the pond Spidy was hoping to avoid at all costs can make anyone feel like an old pro in no time at all. Although an end-of-level score of two out of five does tend to bring you right back down to Earth, which seems appropriate given that Spidy traveled all the way here from the depths of space to find his friend. 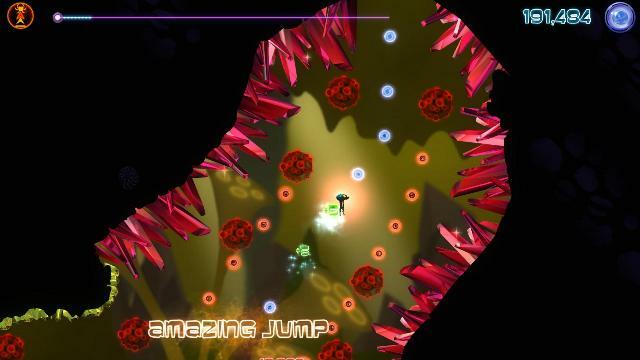 Alien Spidy isn’t your friendly neighborhood spider platformer. It is, however, a fun game that seems to have found a healthy balance between challenging the player and punishing him.